In a tweet last Friday, Ken Jennings intended to mention my alma mater. But he failed. He was imagining a space traveler unable to find words to express the wonders around him. Brown? An Ivy League school? In his next tweet Ken confided, I really wanted this to be Oberlin instead but couldn't get it to scan. I feel slighted. AUGUST 24, 2016 STOP? GO AROUND? Let's take a look at the pros and cons of roundabout intersections, including a downtown racetrack in nearby Rochester, PA. My article on this subject is called Courteous Circling. In college, I used to rip the news off our campus radio station's UPI teletype and read it on the air. Often my shift was the 5:30 pm newscast on Thursday. What sports stories break at that hour on a Thursday? Almost invariably, I found that the sports section led off like this. The standard sentence could have been written by a machine. Nowadays we're told that the Associated Press is allowing a computer program to begin filling in the blanks. It uses the data from minor league box scores to generate baseball stories automatically. No human sportswriters are required to actually watch the games. However, the robot isnt taking away anyones job. In this era of budget cutbacks, as I noted earlier about high school football, theres less and less actual in-person newsgathering going on these days. 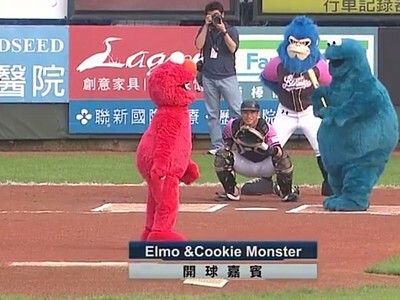 No reporter would have been assigned to these particular minor league games anyway. 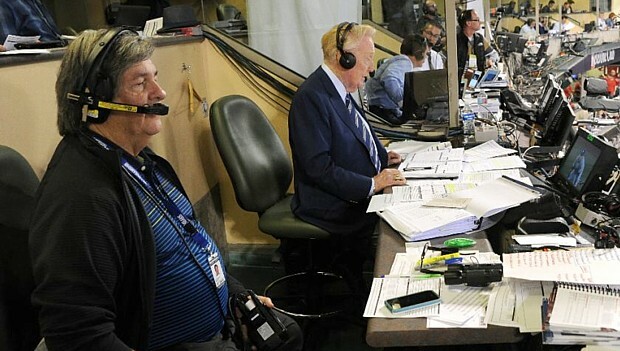 Vin Scully is drawing closer to the end of an amazing 67 years of broadcasting Dodgers baseball. Yesterday he called his final Pittsburgh at Los Angeles game. I crossed paths with Vin only once. It was ten years ago in the restroom of the Dodger Stadium pressbox. But his assistant  now theres a different story. 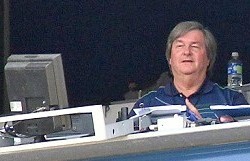 Boyd Robertsons specialty is the position we call stage manager, overseeing various details in the announcers booth. 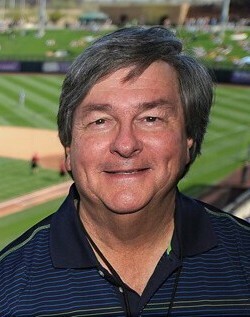 In 1987 I started traveling as part of the KDKA broadcast team covering the Pittsburgh Pirates, and I relied on his help any time we televised from L.A.
As the graphics operator, I couldnt actually see the game. I was out in the parking lot, sitting behind a keyboard in a truck called the mobile unit. My view of the ballpark was limited to what the cameras were shooting. If a pinch-hitter came out on deck or a reliever started warming in the bullpen, the stage manager needed to notice it and alert me via headset. I also required his assistance in other situations. Hed bring me the starting lineups as soon as they became available. When I forgot to mark something on my scorecard, hed help me fill in the gaps. And late in the game wed discuss which pitcher would be awarded the win and which would take the loss, barring any further scoring. Boyd was always great to work with. I was glad to see him on a few other occasions when he came East or when we were televising a sport other than baseball. 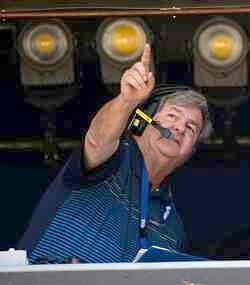 But starting in 1989, he rarely had to deal with visiting broadcasters like us because he had joined Vin Scullys crew. I didnt see him much after that, except on a July 2005 edition of HBOs Real Sports in which Bryant Gumbel followed Vinny behind the scenes. This article from last month, when the Dodgers were on the road at Anaheim, brings us up to date on the Boyd Robertson story. Good luck to him, wherever he goes from here! Indeed, many professions were effectively closed to women when I was a young man in 1970. But that didnt stop fellow Oberlin College graduate Jan Olson. She was going to be a doctor. She applied to several medical schools including the Yale School of Medicine, only to discover that Yales admission policies favored men. Jan got herself accepted elsewhere. 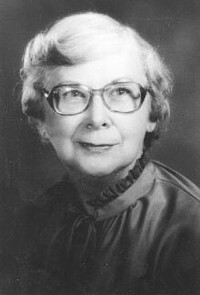 Some mossbacks didnt trust physicians of either gender, as I later wrote to Dr. Olson. Listening to the radio recently, I happened to run across a preacher who was talking about having faith in what God tells us, using Luke 1:19-20. Then he quoted James 5:14-15, in which we are told that if the elders of the church pray over a sick man, God will cure him. So why is it, asked the preacher, that when we are sick we go to a doctor? Thats one of the strange tangents that can result from a too literal, too uncritical reading of the Bible. Other verses, like I Corinthians 14:34 and I Timothy 2:12, had excluded women from church leadership positions. But by 1980 Jan was able to tell me proudly that her newly elected bishop in Wisconsin was Marjorie Matthews (left) from Colgate Rochester Divinity School, the first woman to become a bishop of the United Methodist Church. The rest of that poem, and the one I wrote in reply, are to be found in this month's second installment of Letters from Jan: Readjustment. AUGUST 5, 2016 OBRIGADO! EU SOU RICO! As you may have heard, the Olympic Games are getting under way down in Brazil. The opening ceremony will be tonight. My most recent summer Olympics telecast was in 1996, where I provided a small part of the graphics for the international feed. That year in Atlanta, my first assignment was the opening ceremony (at right). There was much speculation about which celebrity might receive the honor of lighting the flame. For a few minutes I was one of the only people in the world who knew the secret; they told me in advance so I could prepare a lower-third identifier. Even Bob Costas didn't know who it was going to be until Muhammad Ali stepped out to take the torch. Once the competition began, my assignment changed to events on the stadium track. For example, there was as the 200-meter dash. 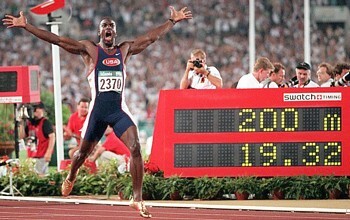 In the final, Michael Johnson set a new world record by more than a third of a second. Today, however, Im recalling another gathering of nations for a different festival of athletic competition. There a stranger from Brazil gave me money. For no reason at all, he handed me 100,000 Cruzeiros! That sounds like a lot, but due to inflation at the time, the large-denomination bill was barely worth a couple of bucks American. Due to subsequent inflation, nowadays the souvenir isnt worth the paper its printed on. Nevertheless, the anecdote is worth three paragraphs in this months 100 Moons article. AUGUST 1, 2016 AWAKE, BETTER ANGELS! When I consider the possibility of Donald Trump becoming Commander in Chief, two specters haunt me. One is Donald Trumps incompetence. The other is his voters hostility. He has made clear, the Post continued, that he would drop allies without a second thought. The consequences to global security could be disastrous. 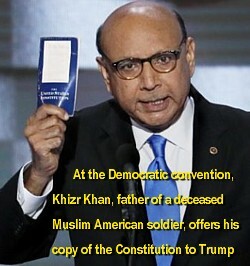 Most alarming is Mr. Trumps contempt for the Constitution. ...He doesnt seem to care about its limitations on executive power. He has threatened that those who criticize him will suffer when he is president. I remember 1972, when the Democrats nominated Sen. Thomas Eagleton of Missouri for Vice President. Two weeks later, we learned he was on the anti-psychotic drug Thorazine and had received electroshock therapy for clinical depression. His doctors said Eagleton's depression could recur and might endanger the country. He was forced to withdraw on August 1. The Democratic National Committee had to nominate a replacement. But things are different in 2016. Crazy Donald is not going to give up. Although only one out of every 24 Americans cast a ballot for him in the primaries, that still amounts to 13,300,472 votes  a total that Trump proudly trumpets. Why do so many support him? That, of course, is the problem! Trump does talk like an egotistic white male  not a statesman. His voters cheer for a demagogue who will bully the rest of the world into doing whatever benefits them. He exploits their fears, slams the door in the face of outsiders, demeans dissenters with crude nicknames. Even if he loses in November, his supporters will still be with us. The election must have been rigged. Find a scapegoat! And lock her up! Their seething anger might be a greater long-term threat to the nation than crazy Donald himself. What can be done? Its up to us. Are we going to allow selfishness to block the light of our better angels? 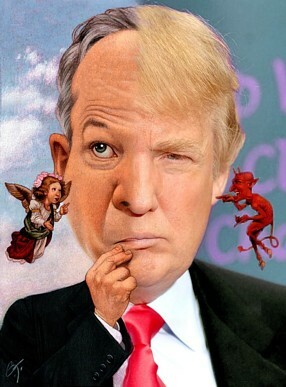 Are we going to listen to those better angels, or to our hateful demons? The temptations are illustrated in this image by C.F. Payne, which I have Trumpified. We are not enemies, but friends. We must not be enemies. Though passion may have strained it must not break our bonds of affection. Two short but newsy letters, the more recent of which I wrote 63 years ago today, can be found in an article I've just added to this website. It's called A Literate Six-Year-Old. Backgrounds for bilingual Asian and European texts really ought to have different aspect ratios. If we insist that complex ideograms be no taller than English letters, we make them almost too small to read. The designer of the seed advertisement on the upper left had a better idea. I actually do watch some of the Tour on TV, but I didn't know the names because I pay absolutely no attention to the competition. I'm still unclear on the concept of a peloton. Instead, I watch the beautiful scenery unfold. It's almost like exploring the back roads of France from a tour bus. At one point we glimpsed an aerial view of a lovely little village alongside a river, dominated by an ancient square stone tower atop a hill. I needed to turn to the Internet to learn that the town was Cessenon-sur-Orb and the tower was the only remaining part of a fortress that was probably built in the ninth century. That's the sort of thing that interests me. 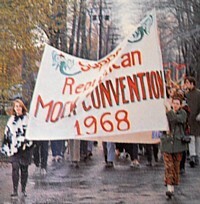 Did you know that I once helped broadcast a GOP political convention in northern Ohio? 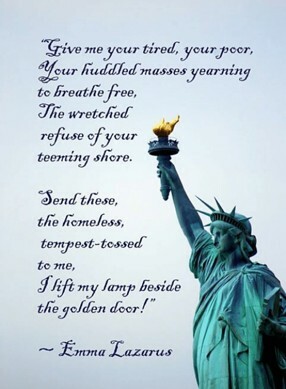 This happened so long ago that the delegates nominated a moderate Republican for President! Also, they heard a speech from a different moderate Republican who served as the permanent chairman of the convention. Although he was not introduced as The Next President Of The United States, he actually did become the second-to-next. Who was this chairman? Check out this month's 100 Moons article. And by the way, the convention to which I'm referring wasnt held in Cleveland but in a small town 30 miles away. When I started working in television 46 years ago, I worked for one cable TV company and then another. Each cable system needed to fill the dial with a full 12 channels, so they originated one themselves. Most of the time this channel ran automatically. Viewers heard background music and saw an automated display of weather conditions and messages. Some of the latter were paid local advertisements, but subscribers could also request public service announcements for their organizations. Cablecasting these PSAs was good for business. 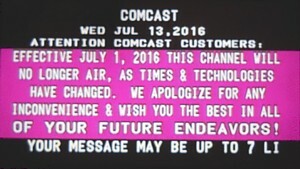 Well, nothing lasts forever, and I see times & technologies have changed. My present local cable provider stopped updating their PSAs on July 1. True, the automation was still running the last time I checked; apparently they have not yet decided what to put on channel 13 in its place. But they no longer have to bother with typing up those bake sale promotions, and they wish us the best in all of our future endeavors. Also on July 1, a Mississippi law was about to go into effect. It would have violated freedom of religion, because the state would have imposed the opinions of a favored group of churches upon everybody. The bills sponsors didnt see it that way, of course. At the last moment, however, a federal judge blocked the law, saying it unconstitutionally establishes preferred beliefs. Thats the very opposite of religious liberty. 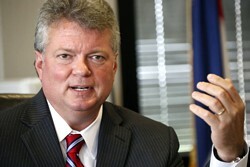 The states Democratic attorney general, Jim Hood, announced yesterday that despite pressure from his governor, he wont file an appeal against the judges ruling. 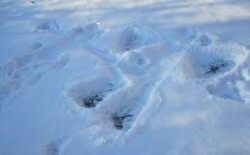 It wasnt Jan who made yonder snow angels. However, she has been lying in the snow outside her dorm for an hour and a half on this bitterly cold night, weeping. So what happened? A friend just spent an hour explaining to her, for her own good, why she has no worth as a person. Shes devastated. She doesnt want to see her roommates. Shes far from worthless, of course, but some of what he said hit home. Shell need to move out of the dorm for several days to find her self-confidence again. But not all the mail I received from her was that serious-minded. In the coming years shed excitedly describe 14 newborn rats. And a goalie husband. And a kicking, wriggling, twisting, jiggling, laughing, giggling, smiling little boy. And LIVERS! As I mentioned last month, my friend has passed away. Now Im starting to post excerpts from a decade of her correspondence. You can find the first batch, including the tale of crying in the snow, at Letters from Jan.
JULY 5, 2016 LASSIE NEEDS US! WHAT IS IT, GIRL? Sometimes, somehow, when an animal is in distress it knows to ask a human for assistance. The classic story, which later made it into Aesops Fables, was first reported by Apion. In first-century Rome, a recaptured runaway slave named Androclus had been sentenced to be devoured by fierce wild animals at the Circus Maximus. 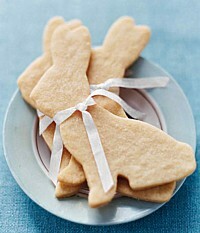 However, one of them came up and licked the prisoners face. Emperor Caligula asked what was going on. He learned that three years before, Androclus had hidden in a cave which turned out also to be sheltering a whimpering lion. Normally its very dangerous to corner a wounded animal in its den, but this big cat allowed Androclus to remove a large thorn from its paw, and they became friends. The animal in the Circus was that very lion! 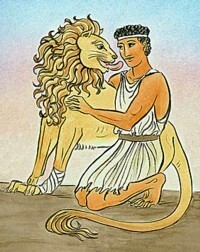 The emperor pardoned the slave, and thereafter Androclus was seen making the rounds of the shops with his lion on a leash. We jump ahead to this May, alongside Mill Creek near Interstate 75 in Cincinnati. Police Sgt. James Givens was parked in his cruiser. There were geese in the vicinity. Normally they dont come near us, he said. I always thought that they were afraid of people, and people say they will attack you if you get close to their younguns. But then a mother goose came knocking on his car door. She kept pecking and pecking, and the sergeant thought she was asking for food until she walked away and stopped and looked back. 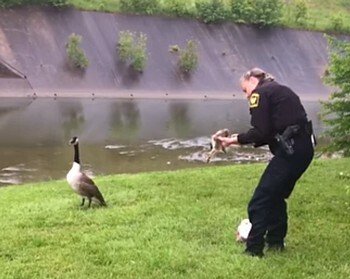 Givens got out of his cruiser, and the goose led him over to one of her goslings that had gotten itself tangled in the string from a discarded Mothers Day balloon. Specialist Cecilia Charron joined him to untangle the little bird. That took at least a minute. The mother goose waited patiently a few yards away, honking softly every few seconds to reassure her youngun. Finally it was free, the mama gave two happy honks, and the two of them headed for the creek. Also in May, a 25-year-old elephant called Pretty Boy was shot in the head by poachers in Zimbabwe. He sought refuge in Mana Pools National Park, wandering around with a hole in his forehead for weeks before help could arrive. When it did, he motioned for assistance, according to reports.